Every woman knows that when it comes to makeup, if you don&apos;t have the right brushes, you&apos;ll have a hard time making your face flawless. Brushes are essential tools for perfecting your beauty game, especially the foundation brush, for the foundation part somehow determines if your whole makeup is perfect or not, which is why we offer you this unique foundation brush with mermaid tail handle that helps you looks best! Thick, ultra soft and smooth hair, won&apos;t tear or irritate your skin, yet can evenly distribute makeup product over your face, helping you perfect your beauty. Comes with a cap for easy storage and carry, which can encase its hair to prevent from mixing with other makeup things or getting dirty by dust, wetness, etc. With mermaid tail handle, the unique shape can do a very good job with your foundation products which offers you easy grip and flexible control. 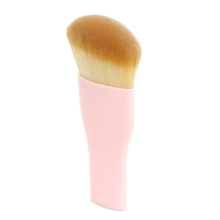 A multifunctional brush, with it you can easily blend foundation and blush onto skin. One brush, dual purposes. A wonderful brush for everyone, essential for both beginners and specialists.